We have exciting news, a baby is expected around Christmas time. 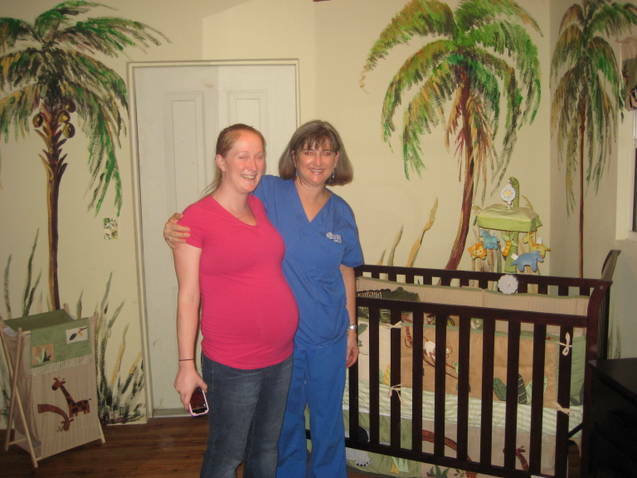 The child will be a 7th generation Floridian on the maternal side. 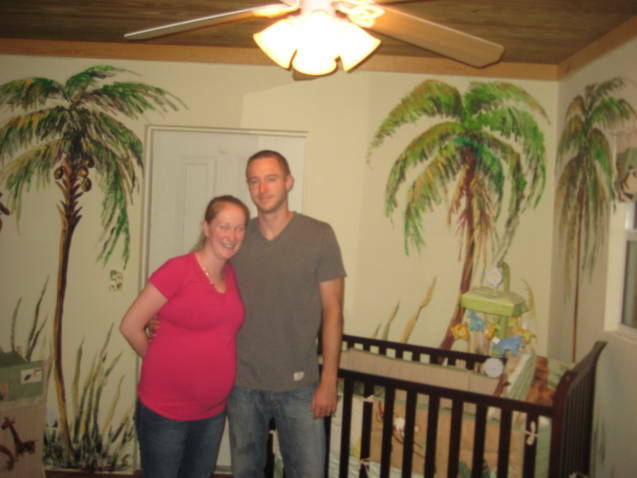 Matt and Mary Rose wanted a Florida theme for the baby's room and animals will feature prominently in the bed linen and accessories. Artist Mary Rose Holmes was commissioned to paint palm trees. 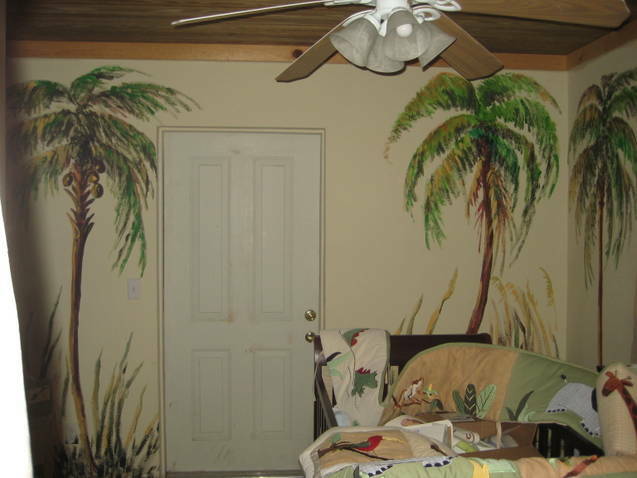 The parents want the child to enjoy the room for many years and decor can be changed as the baby grows. 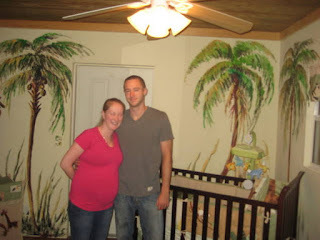 Do you think Mary Rose and Matt are going to have a girl or a boy? For Helen...thank you so much for your kind comments on my blog! What a wonderful artist you are...and you're from Ireland...it has been my lifelong dream to visit Ireland! Blessings! 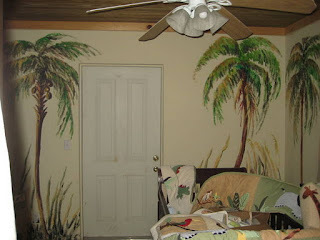 I love wall murals. What a beautiful room and such a personal touch. My gut feel is boy. But it's a 50/50 chance! 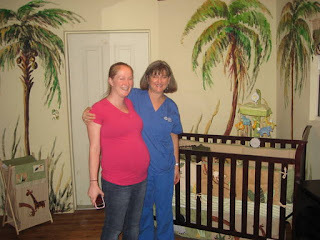 What an adorable room and the art work is amazing. I have always been amazed at how artist can create something with gentle strokes of a paint brush. What talent you have. By the way, thanks for visiting my blog, I'm now your newest follower. Hope your Thanksgiving day was fantastic. 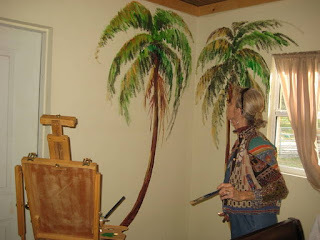 As you know I paint with Mary Rose and Violetta and this particular mural was painted by Mary Rose. Yes I am from Ireland.Please do visit one day and I know you will be welcomed. I can say now that you are 100% right in your gut feeling and guess. Your kind wishes and compliments on our art work is sincerely appreciated.